Download our Care and Maintenance brochure to learn the best, and non-destructive, way to clean your Milgard windows and patio doors to keep them looking their best. You'll find cleaning tips for window glass, frames and even the weep system. Rest assured, we've got you covered. Do you have one of our Moving Glass Wall Systems? See below to download separate instructions. If you like to learn by watching videos, we have a wide selection of "How To" product care videos for windows and doors with easy to follow instructions. You can search by patio doors or windows and then filter the videos even further by subject type. Each one offers a PDF file you can print out for easy reference. Have a little dirt or a smudge on one of your frames? No problem. You can wash it with mild, nonabrasive soap and water. Never use abrasive or acidic cleaners—they might cause permanent damage to the frame finish. Always test cleaners in an inconspicuous area first. Wipe dry when finished. Whether your window comes with the standard energy-efficient SunCoat®Low-E glass or with one of our many specialty glass options such as 4th Surface Low-E, an occasional cleaning is necessary to ensure clarity and exceptional performance. To clean your screens from dust and pollen, remove the screen from the window. When cleaning screens, use only mild soap, water and a soft brush. When finished, rinse with clear water and wipe dry with a lint free towel. Be careful not to use paper towels or other materials that could leave lint on the screen. If you do have dust or lint on your screen try a sticky lint roller and gentally roll it across your screen. We recommend that you lubricate the hardware components at least once a year. In areas with high salt air, at least twice a year is recommended. 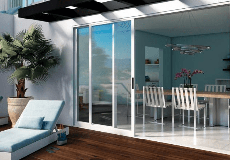 Regularly check weather-stripping to ensure your patio doors and windows seal airtight. Milgard sliding patio door rollers can be adjusted for proper height clearance. To adjust, remove the weight of the operable panel using a putty knife and insert a #3 screwdriver through the access hole at the bottom of your patio door. Mother Nature can sometimes be unforgiving. 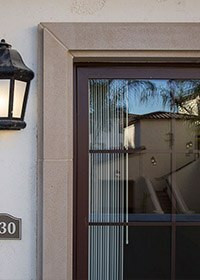 Fortunately, our windows and patio doors have a specially designed "weep" drainage system with vented slots on the exterior bottom of our frames to help protect the inside of your home. Proper maintenance of your weep system is required to assure proper drainage. The weep system allows water to drain to the outside as it builds up. It's normal for water to build up on the sill or the outside track, which is why it's important to keep the sill or track clean of any dirt or debris. Periodically inspect the weep holes on the exterior bottom rails to make certain they are clear of any dirt or debris. Use a soft brush to clear openings, if necessary. Milgard Premium Exterior Vinyl Finishes, as with all coatings, need regular maintenance to maintain the beauty of the finish and give you years of trouble free performance. Debris, contaminants such as bird droppings, or sand from a coastal environment should be removed immediately. First, remove any large particles with a soft bristle brush. Then wash the surface using warm water, a mild detergent and a soft absorbent cloth. Never use a dry cloth as hard particles can abrade the finish. Never use abrasive or acidic cleaners - they might cause permanent damage to the frame finish. Periodic or seasonal cleaning using these steps will maintain your premium finish for years to come. Your Milgard windows and doors with Premium Exterior Vinyl Finishes come with a complimentary bottle of touch-up paint. This paint is designed to closely match the factory finish supplied on your Milgard windows and doors and is intended for covering small chips and minor scratches. Due to the differences in cure and application the touch up area may not perfectly match the factory finish. Exterior condensation results from the same environmental conditions that cause dew to appear on grass or condensation or frost to appear on a car that is parked outside overnight. It forms when moist air comes into contact with cool surfaces such as glass, when the dew point in the air is higher than the temperature of the glass. This can happen when a cool night follows a warmer day, typically during the spring and fall seasons. Condensation generally does not occur with less energy efficient windows, because heat from the warm interior of the home escapes through the window, keeping the exterior temperature of the glass high enough to prevent condensation. 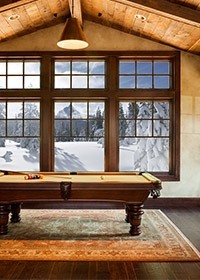 In contrast, energy efficient windows significantly reduce the interior heat conducted through the glass. This lowers the temperature of the outside glass, which at a certain dew point can result in condensation. Exterior condensation is actually an indication that the insulating glass in your windows is performing as it should, reducing heat loss and lowering utility costs. It is a result of the normal functioning of energy efficient windows. Window Size: Larger windows may have a higher tendency to show condensation. Window Location: Minor differences in conditions can cause condensation to form on one window and not another, even when they are side-by-side. Windows protected from the wind will have a higher tendency to show condensation. Air Circulation: Good air circulation, such as exposure to wind, reduces the occurrence of condensation. Building projections, foliage and other wind-breaks may contribute to condensation. 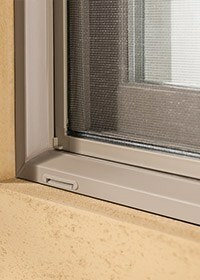 Screens: Windows protected by exterior screens may have different condensation than the same windows without screens under the same conditions. Interior Shades: Opening interior shades or blinds may reduce condensation by allowing more heat to transfer to the outside. 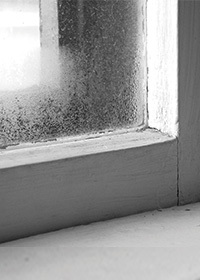 Weather Changes: Condensation on windows can be a seasonal or a night-time event. When outside temperatures are warm, the glass temperature will usually be above the dew-point. The same is true during cold, winter months. Condensation will most often occur during transition months. Moisture Between Panes: Moisture that builds up between the panes of glass may be due to a failed insulating unit, and if so it should be repaired.